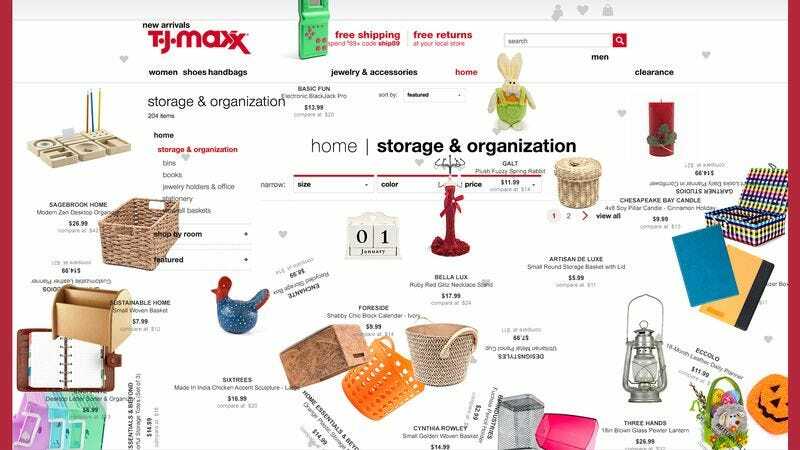 TJMaxx says visitors to its website can now experience the utter disarray of its stores from their home computer or mobile device. FRAMINGHAM, MA—Hoping to capture the “unique essence” of its discount retail stores for online customers, T.J. Maxx unveiled a new website Wednesday that recreates its in-person shopping experience with a selection of miscellaneous products haphazardly strewn everywhere. Company CEO Ernie Herrman told reporters that the site—which features a disorganized jumble of closeout name-brand apparel and home fashions alongside a random inventory of neck pillows, pill organizers, cocktail olives, and dozens of other items—would provide users with the same sense of disorientation that regularly overwhelms shoppers at the chain’s nearly 1,200 brick-and-mortar locations. For their overhaul of the website, company officials confirmed they had included thousands of new high-definition photos so users can zoom in on products such as fingerprint-smudged pint glasses; already-opened packets of decorative napkins; irregular garments with jagged, misaligned seams; and handbags with their straps hopelessly tangled in a hair-dryer cord. According to reports, online customers will also discover a completely redesigned maternity wear section, which when clicked upon appears to consist of nothing but a single pig-shaped charcuterie board. In addition, the site automatically redirects users through several pages of off-brand multicolored iPhone chargers and dusty caramel corn tins before they reach checkout, at which point they reportedly may complete their transaction, paying a price entirely different from what was listed. Herrman also noted that web users requiring assistance can avail themselves of a customer support chat box, where, in real-time, a T.J. Maxx employee will answer any questions one asks with a terse “I don’t know” and then promptly log out, ignoring any further inquiries. “We’re proud to serve anyone who’s willing to click on the page for our luggage department and spend a couple of minutes staring in bewilderment at a 2-foot-tall wooden ‘S’ accompanied by no identifying information whatsoever,” he continued. At press time, visitors to TJMaxx.com could also browse a seasonal Halloween section that featured a jack-o-lantern cookie jar with a visible seven-inch crack, an arctic camo chain wallet, and loose pieces from a magnetic travel checkerboard.